Moonstone Beach - Cambria, Ca. 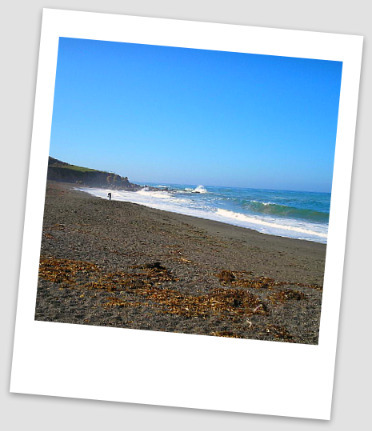 To those of us who live in Cambria, California this Beach holds a special place in our hearts. This section of beach is where we go for solitude, comfort from the sea and to search for the illusive treasures of the sea. The mixture of the cool breeze with the brushing sounds of waves coming ashore allows one to drift quietly into deep thought about life, love and new adventures. 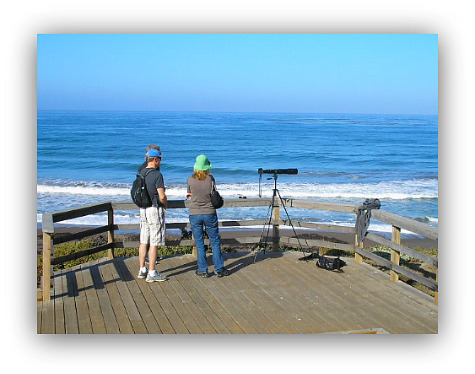 Many locals gather in the parking area to watch for the mysterious whales which frequent the horizon. We rarely see a whale breech the surface but that is ok to most of us. We primarily watch to see the whales stupendous spout of sea water out in the distances and that is enough for most of us. Many locals walk the beach day after day in search of treasure. No, there is no gold or silver on the beach but we do find something just as precious, at least to us. The rocks and sand on the beach yield a vast array of sea glass and moonstone rocks. My wife and I have walked many a mile along the beach with your heads down, eyes darting back and forth through the rocks searching for tiny bits of ocean washed glass and the spectacular moonstone. We make a game out of the search. Who can find the first piece of glass or stone? My wife normally wins because she can see better than I can. The moonstone is a type of feldspar which is one of the most abundant minerals on earth. The name Moonstone comes from a resemblance to the moon. There is a mystical side to the stone. The ancient Romans believed the stone was made from moonlight. In recent times the stone is believed to bring luck and good fortune. However, for us it is fun to go to the beach and spend hours diligently searching for treasure. 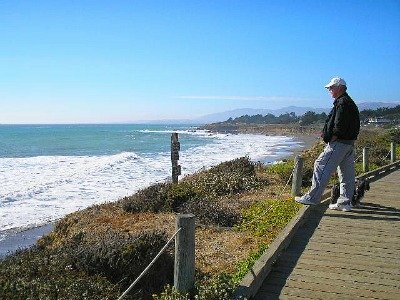 You can find many treasures on the beach in Cambria. One day I was walking along and stumbled on a Abalone shell. I had just arrived in Cambria and I didn't have any idea what an abalone was or how rare it is to find a complete half shell on the beach. You can find all sorts of rocks, shells and if you are lucky, like I was, you might even find an Abalone shell. Surfing is popular sport in Cambria! My wife and I rarely put our feet in the water let alone surf. The waters of the pacific are extremely cold in this area but it doesn't seem to bother the surfers. If you like to surf or just watch surfers you have come to the right beach. When you visit Moonstone Beach look for Jason Hall. He is a professional photographer who specializes in photographing surfers. If you would like to see a few of his pictures click on the link. Moonstone Beach Pictures. Would you like to take a dip in a heated swimming pool in Shamel Park? Maybe let the kids swing or climb on the monkey bars. Shamel has a host of things to do. 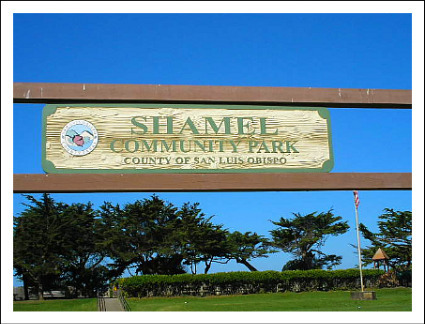 Shamel Park is located on the south of end of Moonstone. It is easy to find. Going north on hwy 1 look for the Shell Gas Station on the right. When you come to the light, which is Windsor Drive take a left. Follow Windsor for about one half mile and you will run into the park. The park has swings and a play ground for kids. It also has a large area of grass to throw a football, play soccer or let the kids or dogs run wild. If you are into picnics, Shamel Park has picnic tables and out door grills for you to cook your chicken, hot dogs, steak or anything else you would like to eat. 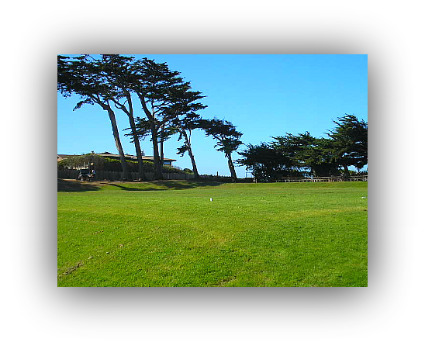 Moonstone Beach and Shamel Park are great places to relax and enjoy the cool air, green grass and listen to the sound of the ocean. You can bring your dogs but you need to keep them on a leash. The sound of the waves crashing made for a great videos on the beach. A walk on Moonstone brings a sense of peace and wonder. We love to search for sea glass and let the dogs runs. The kids in the picture are my grandkids and they just had the best time running up and down the beach. If you love the sand, sea and surf as much as we do you will certainly make Moonstone Beach a place to visit while on the Central Coast of California. We want to hear about your visit. If you have pictures send them to us and tell us your favorite place on the Central Coast. Now is a good time to book a room. Most of the Hotels and Motels on the beach stay booked so make sure you book in advance. Make sure you click on the RSS button at the top on the left. You can keep up with all the news from our site.